If you are not a Monster Hunter, click the back button NOW! Continuing with this post will give monsters the go ahead to attack you. Now available the highly anticipated sequel to Jack Templar Monster Hunter by Jeff Gunhus, a 2012 ForeWord Reviews Book of the Year Award finalist. After barely surviving the onslaught of monsters that tried to kill him the day before his fourteenth birthday, Jack Templar leaves his hometown on a quest to rescue his father and discover the truth about his past. Joined by his friends Will and T-Rex, and led by Eva, the mysterious one-handed monster hunter, Jack sets out for the Monster Hunter Academy where he hopes to find answers to his questions. Little does he suspect that the Academy is filled with dangers of its own, many of them more terrifying than anything he’s faced so far. Learn more at http://www.jacktemplar.com. 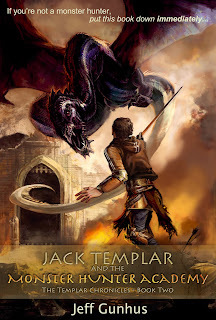 Follow the tour for Jack Templar and the Monster Hunter Academy. A GWR Publicity promotional event paid for by the author. I just tried the Saturday Snapshot this past weekend and enjoyed it. I think I'll stick with that one since I have more time to get around to comment on blogs over the weekend. These are some great resources. Thanks!